Made by BMW and finished in high grade Aluminum with high-grip rubber pads for sporty looks and and a reassuring feel- even in inclement weather. 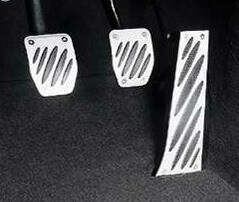 Includes (3) pedals for manual, or (2) for automatic [some automatic models come in stainless steel] -with the option to include or omit an accessory dead pedal cover on some models that they are available for. Kit is supplied with required pedals, rubber inserts, hardware, and some come with simple installation instructions from BMW. BMW's OEM E30 Dead Pedal has been long discontinued. We offer a very nice Weld-in Aluminum replica with these kits. They offer great support to the driver while driving hard. Don't settle for poor quality pedals!